Accuracy, repeatability and activity are very critical factors for rehabilitation of hemiplegic patients. Rehabilitation exercise should be done regardless of space, time and cost. Recently, interesting functional games, which induce active participation, have gained increasing attention. In the current study, a balance ball has been developed that can contract the user muscle and help in natural joint rotation by stimulating the upper arm muscle of hemiplegic patients. Additionally, a functional game was also developed that can engage the patients with rhythm game and training contents. The balance ball can detect the upper arm motion by an acceleration sensor and offered sense of reality and immersion with buttons and haptic sensors. The game applied Fitt’s law to test accurate motion and two tutorial contents that induced their motion based on MFT. The level of difficulty can also be chosen to help intensive training for the motion with low scores from the tutorials and the patients can even do the upper arm rehabilitation exercise while listening to music. via Development of Serious Game for the Upper Arms Rehabilitation: “Balance Ball Rhythm Game” Case Study – Springer. Objectives: A systematic review and meta-analysis using the Grades of Recommendation, Assessment, Development and Evaluation (GRADE) approach; evaluating Botulinum Toxin type A efficacy on improving ease of care in the upper/lower limb. Data sources: Pubmed, Cinahl, Amed, Embase and Cochrane databases. English Language. Search to July 2014.
Review methods: All randomized, placebo controlled trials on adults with difficulty in caring for the upper/lower limb resulting from spasticity of any origin and treated with a single dose of Botulinum Toxin A. Evidence quality was assessed by GRADE. Conclusion: Botulinum Toxin A improves ease of care in the upper limb for up to six months. No conclusion can be drawn for the lower limb. via The efficacy of Botulinum Toxin A on improving ease of care in the upper and lower limbs: a systematic review and meta-analysis using the Grades of Recommendation, Assessment, Development and Evaluation approach. Interactive Motor Learning with the Autonomous Training Assistant: A Case Study – Springer. [Purpose] This study investigated the therapeutic effects of virtual reality-based bilateral upper-extremity training on brain activity in patients with stroke. [Subjects and Methods] Eighteen chronic stroke patients were divided into two groups: the virtual reality-based bilateral upper-extremity training group (n = 10) and the bilateral upper-limb training group (n = 8). The virtual reality-based bilateral upper-extremity training group performed bilateral upper-extremity exercises in a virtual reality environment, while the bilateral upper-limb training group performed only bilateral upper-extremity exercise. All training was conducted 30 minutes per day, three times per week for six weeks, followed by brain activity evaluation. [Results] Electroencephalography showed significant increases in concentration in the frontopolar 2 and frontal 4 areas, and significant increases in brain activity in the frontopolar 1 and frontal 3 areas in the virtual reality-based bilateral upper-extremity training group. [Conclusion] Virtual reality-based bilateral upper-extremity training can improve the brain activity of stroke patients. Thus, virtual reality-based bilateral upper-extremity training is feasible and beneficial for improving brain activation in stroke patients. via Effects of virtual reality-based bilateral upper-extremity training on brain activity in post-stroke patients. Background: Return to work (RTW) is a key goal in the proper management of upper limb disorders (ULDs). ULDs stem from diverse medical aetiologies and numerous variables can affect RTW. The abundance of factors, their complex interactions and the diversity of human behaviour make it difficult to pinpoint those at risk of not returning to work (NRTW) and to intervene effectively. Aims: To weigh various clinical, functional and occupational parameters that influence RTW in ULD sufferers and to identify significant predictors. Methods: A retrospective analysis of workers with ULD referred to an occupational health clinic and further examined by an occupational therapist. Functional assessment included objective and subject ive [Disability of the Arm, Shoulder and Hand (DASH) score] parameters. Quantification of work requirements was based on definitions from the Dictionary of Occupational Titles web site. RTW status was confirmed by a follow-up telephone questionnaire. Results: Among the 52 subjects, the RTW rate was 42%. The DASH score for the RTW group was 27 compared with 56 in the NRTW group (P < 0.001). In multivariate analyses, only the DASH score was found to be a significant independent predictor of RTW (P < 0.05). Conclusions: Physicians and rehabilitation staff should regard a high DASH score as a warning sign when assessing RTW prospects in ULD cases. It may be advisable to focus on workers with a large discrepancy between high DASH scores and low objective disability and to concentrate efforts appropriately. via Predictors of return to work with upper limb disorders. Introduction: Efficacy and safety of incobotulinumtoxinA in post-stroke upper-limb spasticity were studied. Methods: Subjects randomized 2:1 to incobotulinumtoxinA (fixed dose 400U) or placebo, with fixed doses for the primary target clinical pattern (PTCP; flexed elbow:200U; flexed wrist:150U; clenched fist:100U). Doses for non-primary patterns were flexible within predefined ranges. Results: At Week-4, incobotulinumtoxinA led to larger improvements in PTCP Ashworth Scale (AS) scores than placebo [least squares mean change±standard error: −0.9±0.06 (n=171) versus −0.5±0.08 (n=88); P<0.001], and more subjects were PTCP AS responders (≥1-point improvement) with incobotulinumtoxinA (69.6%) than placebo (37.5%; P<0.001). Investigator’s Global Impression of Change confirmed superiority of incobotulinumtoxinA versus placebo (P=0.003). IncobotulinumtoxinA was associated with functional improvements, demonstrated in responder rates for Disability Assessment Scale principal target at Week-4 (P=0.007). Adverse events were mainly mild/moderate, and were reported by 22.4% (incobotulinumtoxinA) and 16.8% (placebo) subjects. Conclusions: IncobotulinumtoxinA significantly improved upper-limb spasticity and associated disability, and was well-tolerated. This article is protected by copyright. All rights reserved. via Randomized, placebo-controlled trial of incobotulinumtoxinA for upper-limb post-stroke spasticity – Elovic – Muscle & Nerve – Wiley Online Library. [Purpose] This study investigated the effects of a 12-hour neuromuscular electrical stimulation program in the evening hours on upper extremity function in sub-acute stroke patients. [Subjects and Methods] Forty-five subjects were randomized to one of three groups: 12-hour neuromuscular electrical stimulation group (n=15), which received 12 hours of neuromuscular electrical stimulation and conventional rehabilitation for the affected upper extremity; neuromuscular electrical stimulation group (n=15), which received 30 min of neuromuscular electrical stimulation and conventional rehabilitation; and control group (n=15), which received conventional rehabilitation only. The Fugl-Meyer assessment, Action Research Arm Test, and modified Ashworth scale were used to evaluate the effects before and after intervention, and 4 weeks later. [Results] The improvement in the distal (wrist-hand) components of the Fugl-Meyer assessment and Action Research Arm Test in the 12-hour neuromuscular electrical stimulation group was more significant than that in the neuromuscular electrical stimulation group. No significant difference was found between the two groups in the proximal component (shoulder-elbow) of the Fugl-Meyer assessment. [Conclusion] The 12-hour neuromuscular electrical stimulation group achieved better improvement in upper extremity motor function, especially in the wrist-hand function. This alternative therapeutic approach is easily applicable and can be used in stroke patients during rest or sleep. via Effects of a 12-hour neuromuscular electrical stimulation treatment program on the recovery of upper extremity function in sub-acute stroke patients: a randomized controlled pilot trial. Several cortical and subcortical areas of brain interact coherently during various tasks such as motor-imagery (MI) and motor-execution (ME) and even during resting-state (RS). How these interactions are affected following stroke and how the functional organization is regained from rehabilitative treatments as people begin to recover have not been systematically studied. Role of primary motor area during MI task and how this differs during ME task are still questions of interest. To answer such questions, we recorded functional magnetic resonance imaging (fMRI) signals from 30 participants: 17 young healthy controls and 13 aged stroke survivors following stroke and following rehabilitation – either mental practice (MP) or combined session of mental practice and physical therapy (MP + PT). All the participants performed RS task whereas stroke survivors performed MI and ME tasks as well. We investigated the activity of motor network consisting of the left primary motor area (LM1), the right primary motor area (RM1), the left pre-motor cortex (LPMC), the right pre-motor cortex (RPMC) and the midline supplementary motor area (SMA). In this dissertation, first, we report that during RS the causal information flow (i) between the regions was reduced significantly following stroke (ii) did not increase significantly after MP alone and (iii) among the regions after MP+PT increased significantly towards the causal flow values for young able-bodied people. Second, we found that there was suppressive influence of SMA on M1 during MI task where as the influence was unrestricted during ME task. We reported that following intervention the connection between PMC and M1 was stronger during MI task whereas along with connection from PMC to M1, SMA to M1 also dominated during ME task. Behavioral results showed significant improvement in sensation and motor scores and significant correlation between differences in Fugl-Meyer Assessment (FMA) scores and differences in causal flow values as well differences in endogenous connectivity measures before and after intervention. We conclude that the spectra of causal information flow can be used as a reliable biomarker for evaluating rehabilitation in stroke survivors. These studies deepen our understanding of motor network activity during the recovery of motor behaviors in stroke. Understanding the stroke specific effective connectivity may be clinically beneficial in identifying effective treatments to maximize functional recovery in stroke survivors. Reaction time (RT) has been associated with falls in older adults, but is not routinely tested in clinical practice. A simple, portable, inexpensive and reliable method for measuring RT is desirable for clinical settings. We therefore developed a custom software, which utilizes the portable and low-cost standard Nintendo Wii board (NWB) to record RT. The aims in the study were to (1) explore if the test could differentiate old and young adults, and (2) to study learning effects between test-sessions, and (3) to examine reproducibility. A young (n = 25, age 20–35 years, mean BMI of 22.6) and an old (n = 25, age ≥65 years, mean BMI of 26.3) study-population were enrolled in this within- and between-day reproducibility study. A standard NWB was used along with the custom software to obtain RT from participants in milliseconds. A mixed effect model was initially used to explore systematic differences associated with age, and test-session. Reproducibility was then expressed by Intraclass Correlation Coefficients (ICC), Coefficient of Variance (CV), and Typical Error (TE). The RT tests was able to differentiate the old group from the young group in both the upper extremity test (p < 0.001; −170.7 ms (95%CI −209.4;-132.0)) and the lower extremity test (p < 0.001; −224.3 ms (95%CI −274.6;-173.9)). Moreover, the mixed effect model showed no significant learning effect between sessions with exception of the lower extremity test between session one and three for the young group (−35,5 ms; 4.6 %; p = 0.02). A good within- and between-day reproducibility (ICC: 0.76-0.87; CV: 8.5-12.9; TE: 45.7-95.1 ms) was achieved for both the upper and lower extremity test with the fastest of three trials in both groups. A low-cost and portable reaction test utilizing a standard Nintendo wii board showed good reproducibility, no or little systematic learning effects across test-sessions, and could differentiate between young and older adults in both upper and lower extremity tests. Continue —> BMC Geriatrics | Full text | Novel use of the Nintendo Wii board as a measure of reaction time: a study of reproducibility in older and younger adults. 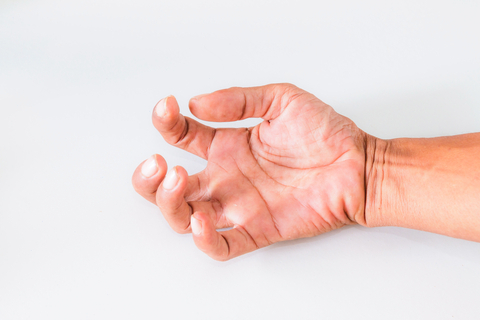 A new type of relief from pain, stiffness, spasms, and in the upper arm that affect millions of adults affected by spasticity has just been approved by the US Food and Drug Administration (FDA). The agency’s approval of Dysport (abobotulinumtoxinA) opens the door to an injection for the treatment of upper limb spasticity (ULS) in adult patients to decrease the severity of increased muscle tone in elbow flexors, wrist flexors, and finger flexors, according to a media release from the drug’s maker Basking Ridge, NJ-based Ipsen Biopharmaceuticals. The Ipsen Biopharmaceuticals media release outlines what the company identifies as key benefits associated with Dysport. Among those benefits, the company reports Dysport is the first therapy in the past 5 years approved by the FDA for the treatment of adults with ULS. Furthermore, the company states, the Dysport Phase III trial was the first registration study to evaluate ULS treatment in adult patients with both stroke and traumatic brain injury. Another benefit reported by the company is statistically significant improvement in muscle tone measured by the Modified Ashworth Scale (MAS) and a significantly higher physician-rated clinical benefit measured by the Physician Global Assessment (PGA) versus placebo at Week 4 (p ≤ 0.05). According to the media release, clinical improvement may be expected 1 week after administration of Dysport. The company also points out that a majority of patients were retreated between 12 and 16 weeks; however, some patients had duration of response as long as 20 weeks. The most frequently reported adverse reactions (≥2%) are: urinary tract infection, nasopharyngitis, muscular weakness, musculoskeletal pain, dizziness, fall, and depression, the media release states. All botulinum toxin products, including Dysport, are said by Ipsen Biopoharmaceuticals to have a Boxed Warning which states that the effects of the botulinum toxin may spread from the area of injection to other areas of the body, causing symptoms similar to those of botulism. Those symptoms include swallowing and breathing difficulties that can be life-threatening. via A Shot in the Arm to Treat Upper Limb Spasticity – Rehab Managment.